What happens when you combine one of my favorite cartoonists, a heated election, and a prediction of a Trump victory. 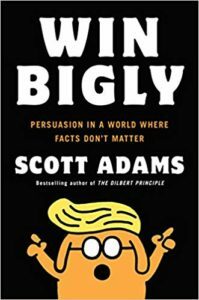 In Win Bigly, author Scott Adams tells the story of how he predicted very early on that Donald Trump would win the election. It is very unusual for someone famous to appear to side with Trump or any Republican for that matter. Before Adams got too far into the book, he did take some time to establish his politics…I guess you’d call him Libertarian-ish. 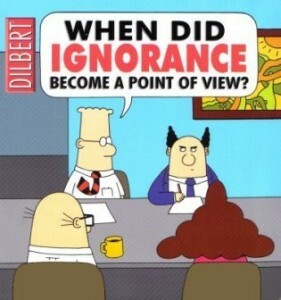 Okay so not really Dilbert, but his creator, Scott Adams. One great thing about reading is articles or books often lead to other interesting articles or books. I recently read $100 Startup which mentioned a Wall Street Journal article by Dilbert creator Scott Adams. As a nearly lifetime cubicle dweller Adams is beloved by me. The following is a link to the original article and a few excerpts that hopefully will make you want to read the article yourself. It may seem strange to include a comic strip compilation in a top ten list of books, and I will admit to being strange. Scott Adams , however, has a way of capturing the insanity of working life in Dilbert that simply makes me laugh. How many of you have clipped a favorite out of the paper and posted it in your office. I laminate the really good ones before they are hung.